After the cataclysmic events in New York with his fellow Avengers, Steve Rogers, aka Capt. 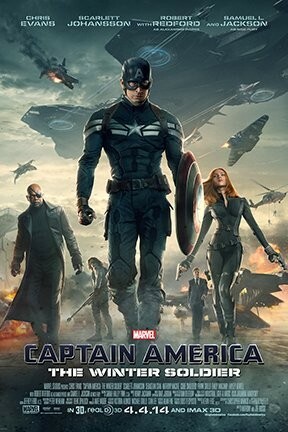 America (Chris Evans), lives in the nation's capital as he tries to adjust to modern times. An attack on a S.H.I.E.L.D. colleague throws Rogers into a web of intrigue that places the whole world at risk. Joining forces with the Black Widow (Scarlett Johansson) and a new ally, the Falcon, Rogers struggles to expose an ever-widening conspiracy, but he and his team soon come up against an unexpected enemy. Captain America: The Winter Soldier -- An IMAX 3D Experience is not showing in any theaters in the area.